If you're one of those people who likes the idea of sprawling yourself out in the sun for hours on end but in practice gets bored and restless then you're a bit like me. I'm hopeless. Along with being half-British and half-Danish I'm like a doomed caucasian cocktail aka. tanning does not come easy! But no sweat - there's a way round it. Take up some new sports for the summer and the tanning hours will fly by. 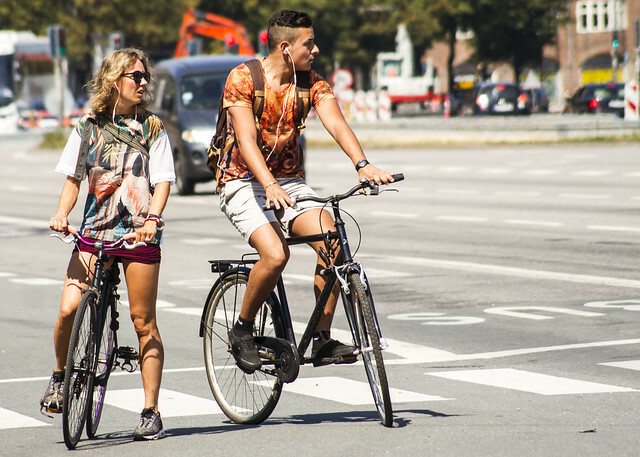 Of course, leave it up to the Copenhageners to show us how to keep it Sporty Chic. Crisp white t-shirt and bright coloured shorts keep it summer cool. Why stick to conventional gym gear? Go all out with t-shirt prints. Here's Jonas and Maria setting off to cycle round the city. Great pair of sneakers Jonas! For the active urbanists, which sports are you guys taking up this summer?